The coat, hat and purse are all fully lined in a beautiful white satin. The red velvet pieces hold up very well and usually look nice - occasionally there will be buttons missing or the velvet will have rubs or worn areas. 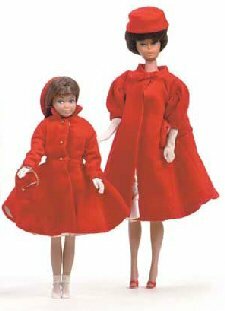 This ensemble coordinates with Barbie's Red Flare #939 (1962-1965). This was and is a very popular ensemble and is fairly easy to find, the coat is much easier to find than the hat and purse.